Owners of the Samsung Galaxy Tab complain that sometimes charging the tablet turns into a real torture by the unknown: the indicator does not show the charge level and it is not clear whether the device is working at all. If everything else the tablet does not turn on, then the alarm only increases. Problems with the lower loop. These are the main reasons why the Samsung Galaxy Tab 2 is not charging and, accordingly, it does not turn on. We now turn to the study of possible ways to troubleshoot problems. If the Samsung Galaxy Tab battery is not fully discharged, connect it to the computer and see if the indicator shows the process of filling the battery. If the tablet does not turn on, try using a similar charger model. If the tablet is charging with another charger (or via a computer), then simply replace the charger. 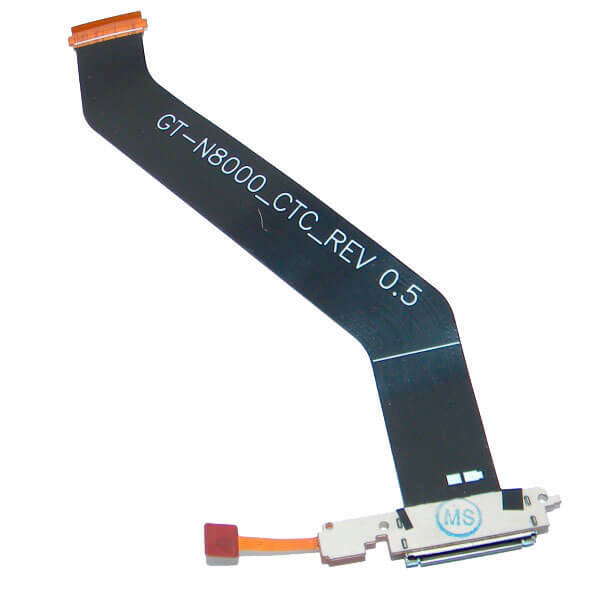 It is recommended to purchase original Samsung Galaxy Tab equipment to avoid compatibility problems..
With careless attitude, the fall of the tablet and other mechanical action possible breakdown of the power connector. Another common cause of failure is wear during prolonged use. The output will be a complete replacement, as the repair will cost more than the new part.. If the tablet experienced a power surge while being connected to the network and then stopped charging, the cause of this problem could be the combustion of the power management chip.. Experts recommend replacing burnt chips, rather than trying to repair them, because after a strong voltage surge, they are often not recoverable. The bottom cable contains a battery power module, so if it breaks, problems arise with charging the tablet. It is possible to diagnose a malfunction only in the service center; at home it is better not to try to fix this kind of problem. Samsung tablets have one interesting feature that often misleads users: if you completely discharge the battery and then put the device on charge, the indicator does not light up at first. In this case, you only need to wait a bit - as soon as there is enough charge, the indicator will begin to show the process of filling the battery with electricity. Important: Try not to allow the tablet to completely discharge. According to studies, this leads to a shortened battery life..
Do not bring the battery to a state when the Samsung Galaxy Tab simply does not turn on due to lack of power. Connect your tablet to a power outlet when the charge level drops to 25-30%. 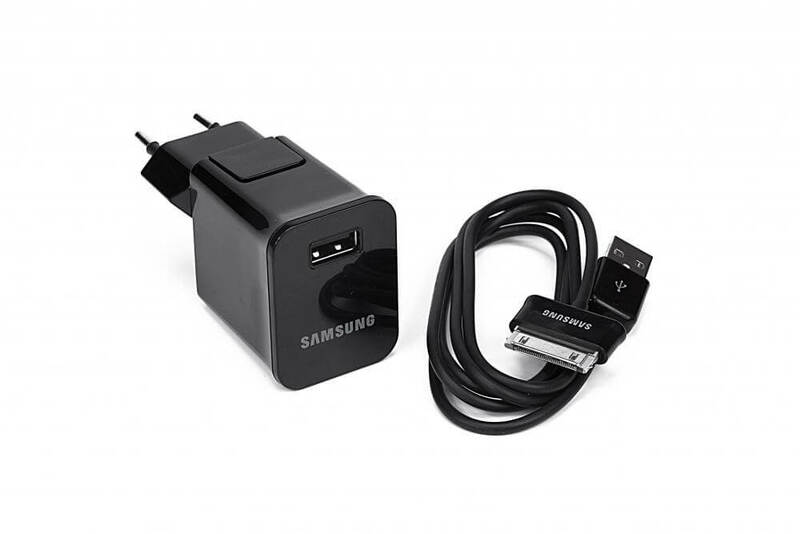 By the way, it is not recommended to charge the device from the computer: it is better to use the standard Samsung charger, which comes in the kit. 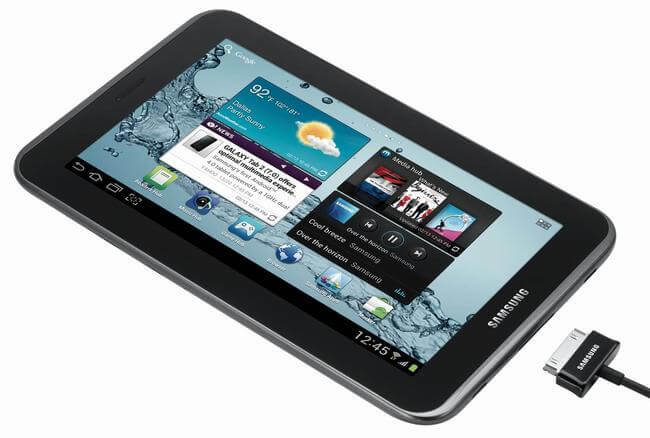 This is especially true when the Samsung Galaxy Tab does not turn on due to the full discharge of the battery. Low current does not move the charge level from zero, or this process will take a long time, so do not abuse the use of a computer to recharge the battery with energy. Connect the device to the network (only to a power outlet, the computer will not work) and wait a bit. It is possible that after some time, the indicator will begin to show the charging process. If the indicator does not appear and the device does not turn on, try using a different charger. It is important that it is also manufactured by Samsung; It is better to use a similar charger, which obviously works (charges another tablet without problems). If the failure of the charger is excluded, then the cause of the problem should be found in the tablet itself. As we have already disassembled, the weak points in this situation are the connector and the power management chip, the lower loop. Do not attempt to repair the Samsung Galaxy Tab 2 by yourself..
Any inaccurate physical exposure can lead to even more serious problems. You should also not give your Samsung Galaxy Tab "handicraftsmen" who repair everything that can break - from shoes to tablets. If the tablet does not turn on, and you have determined that the problem is not in the charger, contact the Samsung service center. Remember that the use of original parts for repairs in the end will cost you much cheaper than buying a new tablet or re-repair.